Island WASPIs now have their own, dedicated support group on the Island and are holding their second Rally in St James’ Square, Newport this weekend. They hope to meet and speak to as many people as possible whose lives have been impacted. A group of Isle of Wight Women campaigning the Government for compensation for the loss of their pensions. Large numbers of women around the country are now struggling, and some are living a hand to mouth existence, following the Government’s unfair acceleration of the State Pension Age by the 1995 and 2011 Acts for women born in the 1950s. The changes have affected 3.6 million women across the country. Over a hundred WASPI groups (Women against State Pension Inequality) exist around the country – and over 11,000 live on the Isle of Wight. 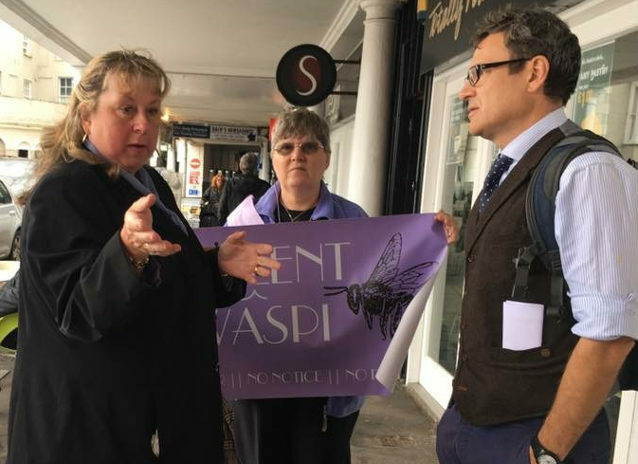 Island WASPI is a part of Solent Waspi which covers Hampshire but Island women now have their own, dedicated, support group on the Island and are holding their second Rally in St James’ Square, Newport on Saturday 10th November between 10am-midday. The group hope to meet, and speak to, as many people as possible whose lives have been impacted. Isle of Wight Conservative MP, Robert Seely‘s office has requested an official invitation to attend the event which they have now received and are considering. Find out more about Isle of Wight WASPI by visiting their Facebook Page. 1 Comment on "Isle of Wight WASPIs to rally in Newport (updated)"
How odd, the MP asks for an invitation, receives one and then wants time to consider it. Why the prevarication?